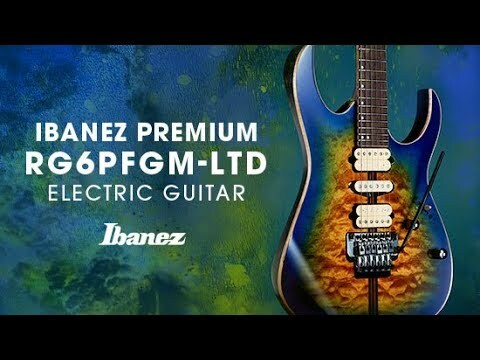 The Ibanez 2018 RG6PFGMLTD Electric Guitar in Geyser Blue Burst is an awesome limited-edition RG that looks impeccable, plays beautifully, and sounds amazing. If you're looking for a model with that something special, then it doesn't get much better than this. Every model is supplied with a soft case to get yours from home to gig in style. The RG6PFGMLTD bears the ergonomically designed RG body shape, with contours that reward precision and speed. The deep double-cutaway affords unparalleled access to each and every fret, whilst the slender body depth combines with the shapely curves to afford a delightful, figure-hugging feel. The angled upper bout rolls off to afford a comfortable resting position for you picking arm, so whether you're playing seated or standing, your playing experience is just as sweet. Built using basswood, the body retains a lightweight feel, and permits you the freedom to move around freely. The basswood produces a hearty mid-range energy, with tempered low-end that doesn't create muddiness, and a softened high-end for hot tones without becoming piercing. Married to the basswood is a unique figured maple/panga panga/maple/purpleheart top, which is finished in a glorious geyser blue burst artwork, which is matched on the headstock. Ibanez RG series' models are renowned for their easy to play, lightning fast neck, and the RG6PFGMLTD is no exception to this rule. Built using a combination of panga panga/maple/walnut/purpleheart, the 11-piece construction offers peerless strength and resilience. You can glide along freely thanks to the Wizard profile, safe in the knowledge that this beauty can take everything that you can throw at it. Paired with the neck is an elegant panga panga fingerboard, which has been treated to Ibanez' Premium fret edge treatment for seamless transitions between each and every fret. The 24 frets at your disposal at decorated with mother-of-pearl off-set dot inlays, as well as luminescent side dot inlays to guide your way on the darkest of stages. The Ibanez 2018 RG6PFGMLTD is equipped with a trio of DiMarzio pickups with an Air Norton, a True Velvet, and The Tone Zone in the neck, middle, and bridge positions respectively. The DiMarzios are perfect for making the most of the tonewood's versatility, and are fantastic for generating a huge dynamic range for you to take advantage of. Whatever kind of musical style you wish to execute, these pickups will see you through, but if you're a fusion, rock, or metal player, then you will adore how much they open when you give them a push in the right direction. The Ibanez 2018 RG6PFGMLTD Electric Guitar in Geyser Blue Burst is equipped with an Edge-Zero II tremolo bridge with Zero Point 3Fe locking system. Adjusting over the bridge couldn't be simpler, thanks to the dial in the spring cavity that can be attenuated with ease - a bonus for those who like to perform elaborate trem bar gymnastics. The headstock is home to Gotoh MG-T locking machine heads, which uphold tuning integrity with precision throughout the most bombastic of performances, allowing you to rock out to your heart's content.